This section of Silver Bow Creek that runs through Slag Canyon in Butte will be rerouted in EPA's "proposed plan" for changes to the 2006 Record of Decision. Updated and expanded, April 11, 5:45 p.m.
I’m down in the valley at the bottom of the Butte Hill with Nikia Greene, looking at two skinny headwater streams flowing towards Silver Bow Creek and the Clark Fork River downstream. "This is Blacktail Creek. We’re just above where the confluence of Blacktail Creek and Upper Silver Bow Creek, at the Visitor’s Center. You can see a wetland in the background," Greene says. Greene is the Environmental Protection Agency’s project manager in Butte. Thursday the EPA released the changes they want to make to the 2006 legal Record of Decision (ROD), which governs the Superfund cleanup for the Butte Hill, and this creek corridor right in town. This new "proposed plan" was developed in consultation with the state Department of Environmental Quality, and is the two agencies’ pathway to finishing Butte’s cleanup, which was started in the 1980s. It’s also the scaffolding of the final, larger Superfund deal currently being negotiated by EPA, the state of Montana, Butte-Silver Bow County, and Atlantic Richfield, the company on the hook for most of the cleanup. Inside the visitor’s center, Greene tells me, "The overall goal here is to protect Silver Bow Creek." To do that, the agency proposes removing more historic mine waste from the creek corridor than was called for in 2006, and installing big basins at the base of the Butte Hill to catch and passively treat contaminated stormwater running off it. Stormwater is a persistent engineering challenge in Butte because the Hill is so steep, the receiving streams are so small, and, "The Butte Hill is remnants of 130 plus years of mining. And it’s a mineralized area, so everywhere you go, everywhere you look, the soils have associated metals with it," Greene says. EPA also proposes filling gaps in the current groundwater system, and rerouting a section of Silver Bow Creek away from Slag Canyon, which is also plagued with mine waste. But even with additional cleanup work, Greene says EPA’s models show that during storm events, the creeks still won’t meet the state’s stringent water quality standards for some metals that are toxic to aquatic life in high enough concentrations. So the plan proposes waiving some state standards and replacing them with federal ones. "We’ve expanded the remedy, and we’re changing the standard because we’ve found that it’s pretty much impossible to meet total recoverable copper and zinc during storm events." EPA’s proposal also offers the potential of water quality waivers for other contaminants in the future, after the cleanup is done, if monitoring shows that Silver Bow Creek is still exceeding the in-stream limits set by the state. Greene said Blacktail Creek frequently exceeds state standards during storm events, even upstream of where most historic mining activity occurred, and the agency is investigating where that contamination might be coming from. Nora Saks: Some folks might perceive this as a loophole for avoiding cleanup, I think that’s even what the EPA said. So how do you respond to that critique? Nikia Greene: Well ... it can be debated. I think instead of so much focusing on that debate, we’re focusing on making these massive changes. So I think that’s where the discussion lies, is that we’re getting a remedy that the state and the community has been fighting for for a long time. He also said many other states have moved to the federal water quality standards, which analyze dissolved, rather than total recoverable, metals. "I’m a federal employee. I believe that the federal standard is protective." 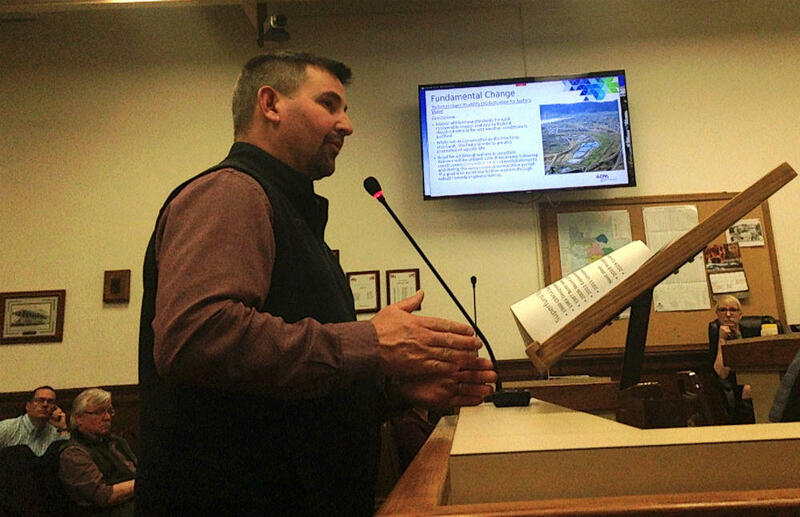 Greene presented EPA’s proposed plan to the Butte-Silver Bow Council of Commissioners on Wednesday night. Commissioner Jim Fisher questioned EPA’s argument that meeting state water quality standards in Butte’s creeks is primarily a technical, rather than financial, issue. After the meeting, Fisher said he sees the waiver as a permit to put more pollution into the water. "Which I feel is, if it’s good enough for Butte to pollute, it should be good for the whole state. And I think we’re kind of taking a back seat because of that, and it’s because of our mining. But sometimes I think that EPA and ARCO find the least expensive route to solve our problems." The Council of Commissioners will be weighing in on proposed modifications to the ROD, or ROD MOD, and voting whether to approve the final Superfund deal before it is lodged with the court. For the next 60 days, EPA is soliciting public comment on the proposed plan, and will hold two public meetings in Butte. For more details, click here. The Montana Superfund liaison that the Environmental Protection Agency hired in February has quit. Her departure comes during a critical decision making period for both the Butte and Anaconda Superfund sites. EPA Liaison Jacqui Barker quit as the agency’s community involvement coordinator for most of Montana’s Superfund sites after just two months on the job, citing personal reasons. After more than 30 years on the EPA’s Superfund National Priorities List, the federal agency has given Butte a date for finalization of a legally binding cleanup deal for the Butte Hill and the Upper Silver Bow Creek corridor. Richest Hill episode 01: Get to know Butte, Montana, one of America's biggest Superfund sites and one of Montana’s most compelling places. Richest Hill is a new podcast about the past, present and future of Butte, America, "The Richest Hill on Earth." At first glance, Butte, Montana's mutilated industrial landscape is often written-off as an ecological sacrifice-zone. Dirty, ugly as sin and regrettable, but necessary to supply the country with perhaps the most basic necessity of the Electrical Age: Copper. But if you take the time to really look carefully, what you find here will challenge, surprise and even change you. Take a closer look at the copper that put the Richest Hill on the map; the city's storied past; and the nostalgia and sense of purpose that pervade the Mining City, right now on Richest Hill episode two. BUTTE, Mont. (AP) — Last month's harsh winter weather has delayed a pilot project that aims to stop the rise of toxic water in Butte's Berkeley Pit. Montana Resources' Mark Thompson tells The Montanan Standard the mining pit is still frozen over, construction has slowed and the project to treat and discharge the water isn't expected to begin until June.